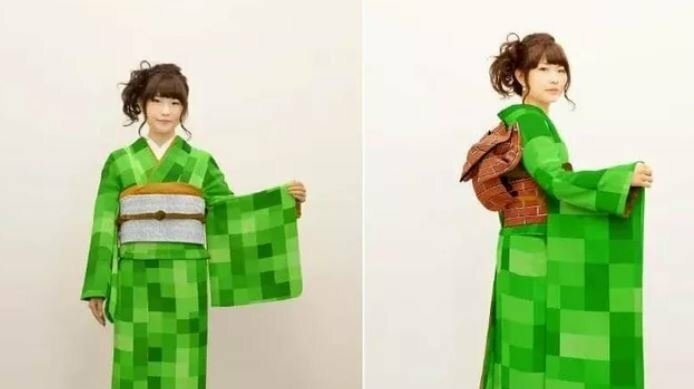 When one kimono design tried to get a little artsy with a vibrant green “mosaic” design, it accidentally became pretty much the best piece of Minecraft merch on the market. Now it just needs an Enderman in the background and a block of TNT, and this would legitimately be the best thing to hit Minecraft since Minecraft. Even if it was accidental. While I couldn't find the actual source of the kimono (yeah, I was tempted to buy it), I did see this while perusing 9gag for my daily dose of WTF. It's not just that it's pixelated either, it's the exact color match of the Creepers in Minecraft, and in the exact perfect design? Maybe it was an inside joke, or maybe I'm wrong and this wasn't a mosaic line (which is what several people over on the 9gag thread mentioned), but whatever the case may be, I'll take 10. In other Minecraft news (in actual news), the beloved building game is officially making its way to the Xbox Game Pass on April 4th! With a rich community of entire worlds built by players, to just sitting back and building something solo with the serene sounds of the game, it's a great time for fans to get into the game if they haven't already. The best part? As part of the Xbox Game Pass, it's free for members of this subscription. Play games across multiple genres, from action/adventure and family favorites to shooters, sports, puzzle games, and more. And with new titles added every month, you’ll always have a wide selection of great games to choose from. Love an Xbox One game and want to own it? Interested in an add-on or Season Pass for a title you’re playing in the Xbox Game Pass catalog? Save 20% on Xbox One game purchases and 10% on all related add-ons, but only while the base game is currently in the catalog. Xbox 360 games do not qualify for discounts. Thoughts on the above kimono or Minecraft in general? Sound off in the comment section below, or hit me up over on Twitter @DirtyEffinHippy.